Deltares is eager to work with business and to open up new products, services and markets for entrepreneurs. We combine your know-how and entrepreneurship with our specific, global, expertise. That can generate wonderful new opportunities. Our know-how is a sound basis for the ongoing development of new products and services for your company. We are happy to make it available to you. This is an efficient approach for you as a business: you will be amazed by the know-how that is already available. And you can put it to work straight away. There are multiple ways to use our expertise. 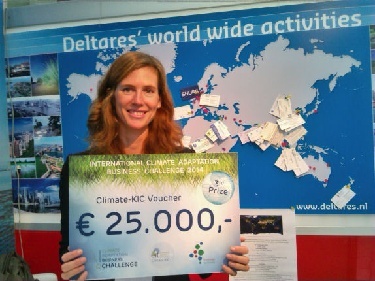 As a client you can work in cooperation with Deltares, but as well as a partner in innovative programs, for example Joint Industry Projects or European researchprograms. Which form of colaboration fits best depends on your wishes, for example regarding secrecy or turnaround time. You will find it useful to know that the first two discussions are always free of charge, so you should not hesitate to get in touch with us. After that point, financing is often needed and we call in external advisers to help us. To provide you with the best possible assistance, Deltares works with SME-Netherlands, SME-Service Desk, Chambers of Commerce, the Netherlands Enterprise Agency and industry organisations.